The National Labour Link Committee after consulting members will make the decision on whether or not it will support Jeremy Corbyn again please comment with name position and branch if you wish to sign the statement and make sure you respond to the consultation when it starts. We the undersigned UNISON members support Jeremy Corbyn as Labour leader. We are disappointed he is facing a new leadership election after winning 59.5% vote less than a year ago. 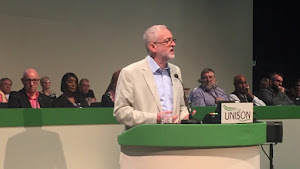 We call on UNISON to once again nominate Jeremy Corbyn, Jeremy Corbyn has successfully repositioned the party as an anti-austerity party and as opposition has lead a battle in parliament defeating the government plans on 22 occasions. Jeremy supports UNISON policies and we support Jeremy. Paula Barker, UNISON North West Regional Convenor. Tony Grieve, UNISON Energy Service Group Executive member and Steward in Scottish Electricity Branch. George Binette, Camden UNISON Branch Secretary & UNISON Branch Delegate to Hackney North & Stoke Newington CLP. Diane Jones, Branch Secretary and Education Officer, Aberystwyth University UNISON Branch. Laney Walsh, Branch Secretary Redditch and Bromsgrove. Paul Couchman Deputy Branch Secretary, Surrey County Branch. Cathy Roblin, Labour link officer Southampton district branch and labour link SE regional committee. Alex Anthony Havering Branch - APF Officer. Member of Hornchurch & Upminster CLP. And Labour Link Delegate for the National Young Members Forum. Lisa Dempster, senior steward and international relations officer, Knowsley branch. Ian Royal TT2 Convener Newcastle City Branch. Marie Macrae, Unison Fife, Retired Members. And Scotland Retired Members Committee. Joy Taylor, Unison Steward, Hampshire County Council. Gill fletcher Liverpool City council. Michael Cole. Middlesex University, UNISON. Enfield Southgate CLP member. If you want to add your name to this statement, please let us know in the comments; include your branch and position if you have one. We the undersigned as UNISON members support Jeremy Corbyn for Labour leader and believe UNISON should support him. Jeremy Corbyn is the candidate that most reflects the policy positions of our union. He is the only candidate that is anti austerity and has already come out in support of UNISON's call for a £10 minimum wage. He supports building council housing, reversing all privatisation of the NHS, funding Social Care and supporting comprehensive education, nationalisation of energy and water, supporting better funding for Higher Education, and an end to loans and fees. Nancy Flynn (Coull) former President and Chair of Labour Link. Jonathan Dunning, NEC, Norfolk County Branch Secretary. John Burgess, Branch Secretary, Barnet UNISON. Nick Hartley, University of Leeds branch. Pam Bromley from Lancashire Unison.